Along with garlic sauce, hot peppersauce, and tamarind sauce, “green seasoning” is one of the quintessential condiments of Trinidad and Tobago, a nation that loves condiments. Other condiments we came across on our trip, either in condiment bars or in Trini refrigerators, included mustard, ketchup, French dressing, chadon beni sauce, fresh grated garlic, sliced or grated cucumbers, fresh pineapple, shredded vegetables akin to coleslaw with or without a vinaigrette-style dressing, chow (which can be made with mango, pineapple, or other fruit), kuchela, and a variety of chutneys. The dizzying and delightful array of options had me swooning! The great appeal of the popular sandwich “bake and shark” lies in the condiment bar. At Richard’s Bake and Shark, Maracas Bay, Trinidad, Danielle explained the many condiment options to the Midwestern Gentleman (above left). 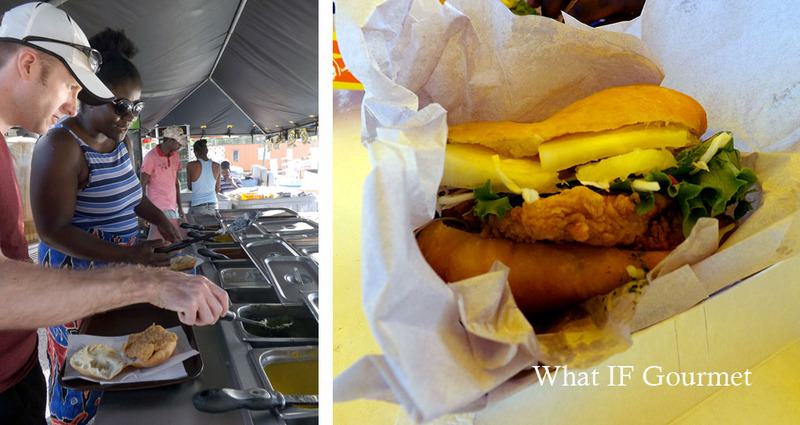 You can see the naked sandwich, a breaded piece of deep-fried shark on a bun of fried “bake,” on the Gent’s tray in the photo on the left, and the fully dressed sandwich in the photo on the right. Chadon beni, in a market in downtown Port-of-Spain, Trinidad. 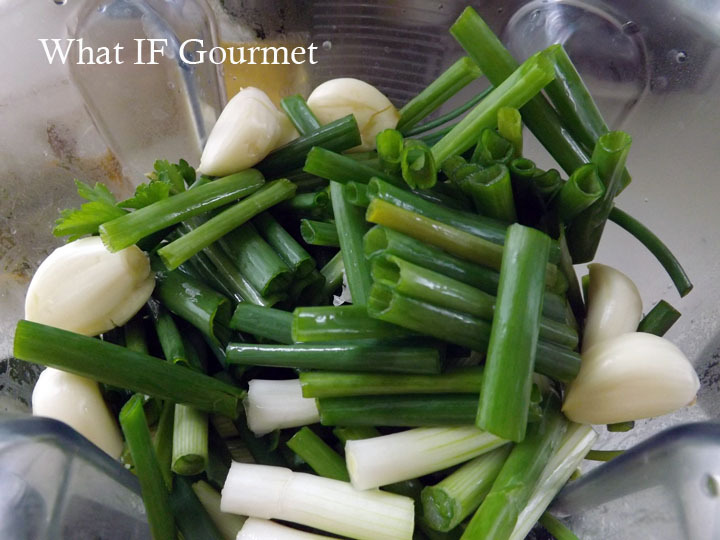 Green seasoning has as many interpretations as salsa does in Mexico, or pesto in Italy, but according to our native Trini friend Danielle, it must always contain at least three ingredients: chadon beni, thyme, and scallions or chives. I have found recipes which also include garlic, white onion, and other fresh herbs such as oregano and rosemary. The base may be vinegar or oil, or a combination of the two. Some recipes include hot pepper (Scotch bonnet preferred). The mixture can be chopped by hand, or pureed in a food processor or blender. So, how do you use green seasoning? It is often an ingredient in Trinbagonian dishes, such as pelau and callaloo, but it can also be used as a marinade for chicken, fish, or shrimp. It is brilliantly tangy and pungent as a table condiment, to be slathered on by the individual diner to taste. We have used it in and on pelau (a Trini rendition of chicken pilaf), stirred into stewed greens, dolloped onto turkey sloppy joes, as a marinade, and mixed with ranch dressing as a tangy dip. After we gave a jar of green seasoning to our friend Kori, she texted one evening to inform me that it makes a delicious dipping sauce for rotisserie chicken as well. I think the point here is that uses for this versatile, nutritious, and anti-inflammatory condiment are limited only by your imagination. Scallions, garlic, cilantro, Italian flat-leaf parsley, and thyme waiting to be pureed into green seasoning. This recipe, for those of us who are not lucky enough to reside on either of the sister islands, cannot claim to be truly authentic. Chadon beni (also called culantro) is difficult to come by outside of the Caribbean and Central America, although in the U.S. it does grow in Georgia, Florida, and Puerto Rico. 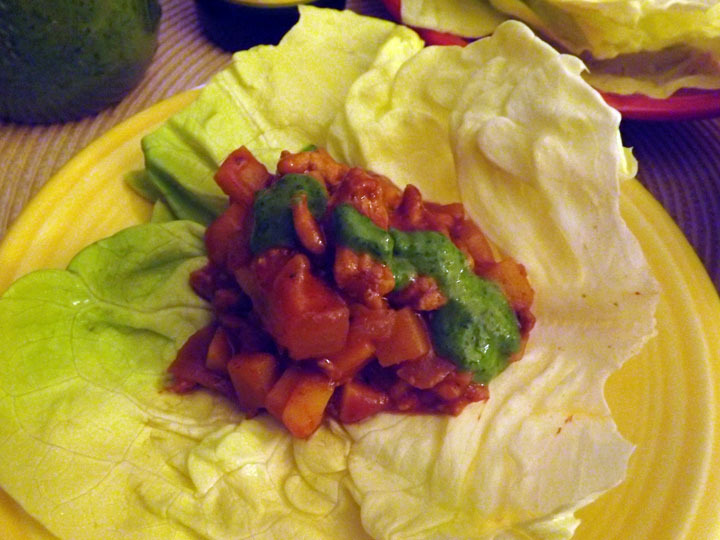 A universally acceptable substitute seems to be cilantro (a.k.a. Chinese parsley or fresh coriander), although this herb lacks the more pungent bite of chadon beni. 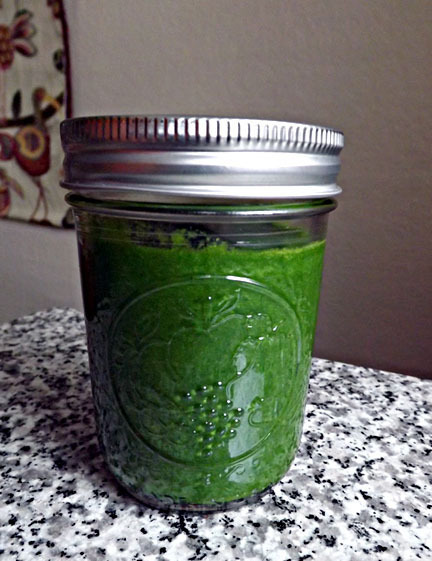 A mason jar of green seasoning. We are on our fourth batch of brightly flavorful green seasoning since returning home from Trinidad and Tobago, and our taste buds have grown addicted. Personally, the Gent and I have found that we like a vinegar base, with just a splash of oil for body. 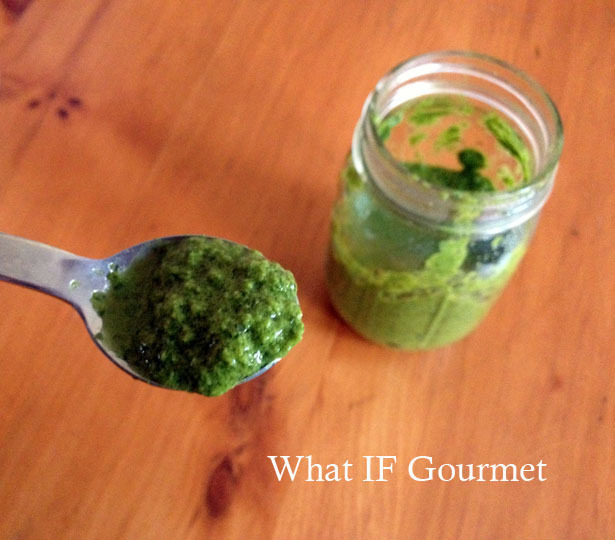 We also like the consistency to be a rough paste – not chunky, but not too smoothly pureed, either. I tend not to measure too carefully, so the mixture comes out just a little bit differently each time, depending on the amounts of herbs we have on hand. I can’t wait until spring, when our herb garden will afford us the luxury of experimenting with even more green seasoning combinations. For now, we are quite pleased with this base recipe. Combine the ingredients in a blender or food processor and pulse until desired consistency. Store in an airtight container (I use a mason jar) in the refrigerator for up to 10 days. Makes about 1 1/2 cups of green seasoning. This entry was posted in alliums (garlic/onions), Anti-Inflammatory Ingredients, Dairy-free, Entrees, Gluten-free, greens, herbs, International, monounsaturated oils, Nut-free, Recipes, Travel, Trinidad & Tobago, Vegan, Vegetarian and tagged chadon beni, chives, cilantro, condiments, parsley, scallions, thyme. Bookmark the permalink. How fun, I love it when travel expands my culinary horizons, sounds like your Caribbean trip really did that for you two. 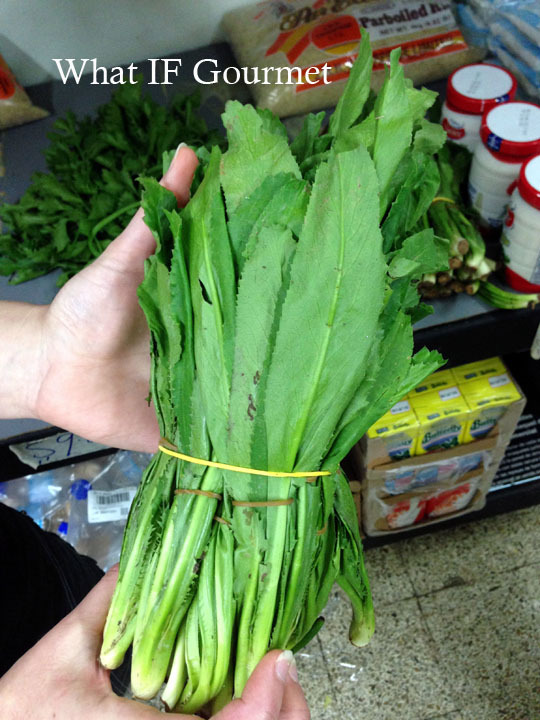 Interesting to learn about the culantro/chadon beni, I had not heard of that herb. I wonder why it is so hard to find here in the US? Things like this make me want to have an extensive herb garden. Apparently culantro/chadon beni is hard to grow from seed, and it grows best in hot, humid climates like the Caribbean. I found a distributor in Florida who ships the seeds, but the website contained all sorts of caveats about how challenging the herb is to grow in northern climates. Alas! I will have to make do with planting lots of cilantro this spring instead. Green seasoning is like salt for us Trini’s it’s in everything…..well almost:;) Gearing up to do my own post on this condiment and randomly googled my way here. It’s nice to read that you had a lovely time while here. Hi! I love this post. Just wanted to say another name for chadon bedi in areas with a high pr or dominican population is recao. So if you are in ny or another Metro area try checking out one of the carribean or spanish markets and keeping an eye out for the name recao as well! It is the main ingredient in recaito the pr version of green seasoning. Awesome — thanks for the tip, Crystal!